Facebook’s Marketplace may soon expand outside of peer-to-peer sales. As of this month, Marketplace has begun showing a new Daily Deals tab on the mobile app for select users, sourcing deals from eBay. The new partnership allows users to browse eBay deals inside the Facebook app, but they must go to eBay’s site to check out. Facebook is again getting into the daily deals space, but this time in collaboration with eBay. The new addition expands the focus for Marketplace, Facebook’s answer to Craigslist. This section today is prominently positioned in Facebook’s mobile app, occupying the central spot on the bottom bar on iOS (or top bar on Android), in between the Video and Notifications icons. To date, however, it has been a peer-to-peer marketplace, not a source for deals from third-party websites, like eBay. That has now changed, as some users will see a new “Daily Deals” section when clicking into Marketplace. The deals will emphasize those products in the Consumer Electronics, Fashion, and Home and Garden categories. At the top of the page, there’s a countdown that indicates how long the deals will be available. 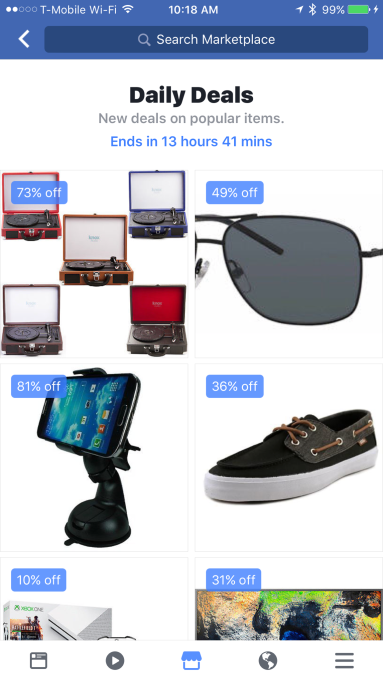 Each item also displays the percentage off. But to see the actual sale price, you have to click on the deal itself. “We're conducting a test to determine if people are interested in shopping for discounted products when they visit Marketplace,” a Facebook representative told The Verge. As with all Facebook tests, the feature may not end up being offered to all users, or it may be killed if users don’t love it.” said Facebook Product Manager, Akash Anand. The Daily Deals feature is currently available to a small percentage of people in the U.S. as of earlier this month and is displaying on both the Android and iOS Facebook mobile apps. While eBay is the current source for these deals, Facebook’s arrangement with eBay is not exclusive. That means if this proves to be a popular feature, Facebook could expand Daily Deals to include those from other third parties as well. The daily deal is an area Facebook explored years ago, during Groupon’s heydey. The idea back then was to connect users to deals for area restaurants, shops, group activities, and more, from local businesses. But these days, businesses that want to reach customers on Facebook set up their own Pages, and run ads. Plus, they can entice users with Facebook Offers, which can also be run as ads. The new Daily Deals section, on the other hand, gives Facebook more of a “real” shopping feature – a way to browse products from eBay’s trusted sellers, then buy right in the Facebook app. Though a different angle on daily deals than before, it’s not the first time Facebook has dabbled with enabling commerce on its site. Most notably, the current “Shops” feature (originally called the “Shopping” feed) pulls in product listings from Facebook Pages, then lets you check out from the seller’s own website, while still in Facebook. Facebook Marketplace, which relaunched last year, gives people a way to buy and sell on Facebook’s platform, marking the company’s deeper involvement with e-commerce. It’s been considered a competitor to Craigslist and eBay, which makes this new partnership a bit unexpected. This month, Facebook expanded the Marketplace feature to 17 European countries, which include Germany, France, Spain, Italy, Ireland, Portugal, the Netherlands, Norway, Sweden, the Czech Republic, Austria, Belgium, Finland, Denmark, Hungary, Luxembourg, and Switzerland.